A SENSATION, a PRODIGY. That’s no exaggeration in describing a young sportswoman who stunned the Table Tennis, the Lawn Tennis and the cricket scene in the country and probably the world in the 1980s. VAJIRA PREMARATNE has left a memorable legacy. 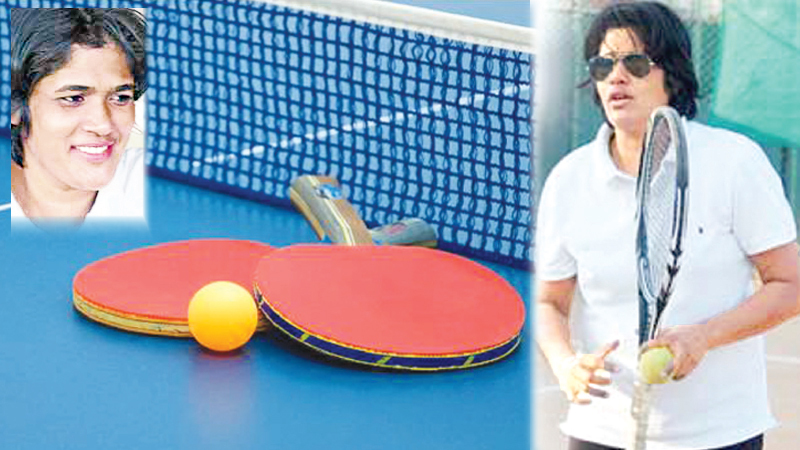 The racquet game – TABLE TENNIS and LAWN TENNIS came naturally to to this young lady. She rewrote the record books with her stupendous efforts in these two sports that came to her with natural flair. VAJIRA just toyed with her opponents, in both sports making them look poor opponents as she just brushed them aside in phenomenal rise to the top where she was crowned the QUEEN of both sports. Before going on to list her astonishing success the writer would like to recall that she had blue blood in her DNA which flowed from the fact that her father WIJAYAPALA PREMARATNE was one of the most outstanding cricketers to come out of that great school from hill capital St. Anthony’s College, Katugastota in the late 1950s. WIJAYAPALA was a dashing and elegant left hand batsman who had twinkle-toed footwork, exquisite strokes all round the wicket who had the natural ability to pulverize any school bowling during his reign. With bat in hand he looked like that Australian left hand stylist Neil Harvey. WIJAYAPALA scored heavily in school cricket and captained the school with great distinction. He became the first Antonian to win the ‘DAILY NEWS’ Schoolboy Cricketer of the Year award in 1956. In addition to his prowess with the bat, he was a brilliant student and entered the University, where he played cricket before leaving with a Degree. He later turned out for Colts Cricket Club captaining the club in 1964. The writer had the good fortune of playing under him in that season. Back to the prodigy VAJIRA. She had as WIJAYAPALA a father who was guiding influence and provided her with all that was required for her to rewrite the record books. He took special interest in her as he quickly noticed her natural talent of being a champion in table tennis and lawn tennis. His influence was enormous and it spurred the young girl to unwind her natural talents which she did with great enthusiasm and former champions of both sports who watched her perform were amazed with her talent and predicted that she had the local sports world at her feet. In the era that she dominated there was not much international activity in both sports. Yet in the opportunities that came her way she stood tall and with her brilliance kept the country’s flag fluttering high. VAJIRA had her schooling at Holy Family Convent, Bambalapitiya from where many promising netballers, athletes and swimming stars who went on to represent the country emerged. Of course it would not be fair if the name of that great Games Mistress of that era Trixie Jayasuriya is not mentioned. She had the knack of turning out champions. Believe it or not VAJIRA’s outstanding excellence in sport sparked off as a 12 year old when she sported Sri Lanka colours when her outstanding showing she was picked to play in the World Table Tennis Championships in Gothenberg, Sweden in 1985. A year later she bagged the Women’s Singles Title beating another formidable player in Sharmalie Dias. Not satisfied with her success with the small racquet, she tried her hand with a bigger racket tennis at the Carlton Club, Moratuwa under an expert coach in T.L. Fernando and with consistent practice and hard work success came her way two years later when she hugged the junior national title. VAJIRA also showed her talents playing in the Federation Cup and she formed a formidable doubles combination with another player of great promise Lihini Weerasuriya. When Sri Lanka played in the Federation Cup in Colombo in 1992 they beat Thailand, Chinese Taipei and Hong Kong in their group and went down only to China. Beating a formidable Taipei team 3-0 is still vivid in her mind which team had the world number 26, Shi-ting Wang in the team. The Sri Lankan team comprised outstanding players such as Lihini Weerasuriya, Saranga Sangakkara and Sobhini de Silva. Saranga is the sister of the famous Kumar Sangakkara who like good wine needs no bush. In 1985 at just 12 she carried away Lion’s award for the Most Outstanding Sports Woman of the Year award. VAJIRA had the distinction of carrying away national level awards in 1990. She was adjudged the Most Outstanding Tennis Player and Most Popular Tennis Player awards offered by the Ministry of Sport. 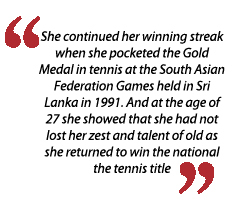 She continued her winning streak when she pocketed the Gold Medal in tennis at the South Asian Federation Games held in Sri Lanka in 1991. And at the age of 27 she showed that she had not lost her zest and talent of old as she returned to win the national the tennis title in 2000. Not satisfied with her resounding and unparalleled success in the Table Tennis and Lawn Tennis arenas, she showed that the cricketing prowess her father had in his DNA also ran in her veins as she took to wielding the willow in 1994 when the famous first lady of cricket, the irrepressible Gwen Herat headed the Sri Lanka Women’s Cricket Association. Playing for the club that her father played and captained Colts Cricket Club she showed all round abilities and was tagged the Best Women’s Cricketer of the country and automatically earned a slot in the national team that that was to jet to India, but prior personal commitments deprived her of making the trip. VAJIRA was an all court player in tennis and no one dared change her strokes because winning came naturally to her. It is said that her cricketing father was her coach throughout her career. Although not being a tennis player he used to read coaching manuals and teach her the finer points of tennis and lawn tennis. National colours in three sports is a rare honor that not all sportspeople in the country are fortunate to enjoy. VAJIRA was one such personality and she was not only a hero, but also a legend that the country could be proud of.